Good Morning! Happy Monday and Happy New Year's eve! This week's Paper Pretties challenge is up and this week we're making Winter Creations. And, I am sad to announce that this is my last post for Paper Pretties. I have been on this wonderful team for a year and I think it's just time for me to go. I have loved my time on Paper Pretties and I thank Heather and Jackie for having me for so long. I also thank ARTish for the fabulous images, she's definitely a favorite of mine. The card I created was using last week's sketch from Try Stampin on Tuesday. I loved the layout and couldn't resist playing with it. Well, I'm off to work so enjoy your Monday and come play along with us! 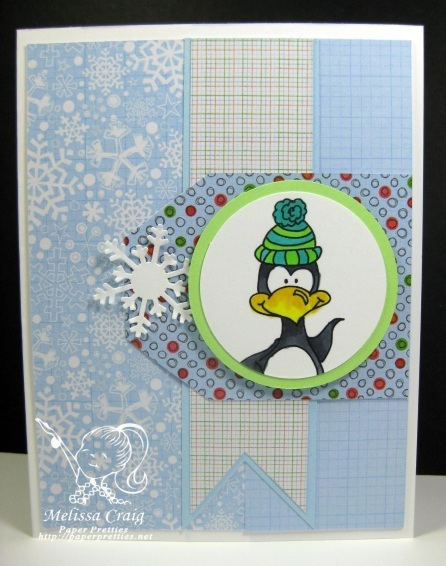 Love all the blue with this cute little penguin! Cute card, Melissa! You are SPOT ON with this card. I LOVE EVERYTHING about it. I wish I could layer like you and it work..haha You card keeps making me giggle. I like how he appears to be peering out of a window and the papers are so happy, snowy and cold and warm at the same time. This turned out cute...I loved the sketch too!